This may be the best bowl of chili you have ever sunk a spoon in. One bowl of this savory potion grabs all the flavor and richness of the Old West. You can add as little or as much heat as you dare! For a Tenderfoot Chili (family style) don't add any heat, but tell them you did! For an Outlaw Chili (medium hot) stir in 1/2 the pepper. 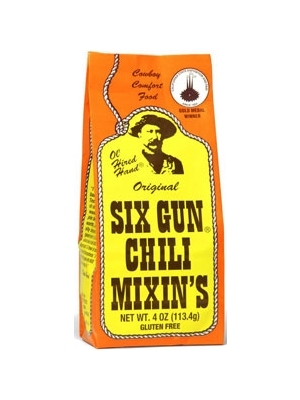 For a Six Gun Chili (HOT!!) add all the pepper then stir it fast if you want to keep your spoon!! Add the 2 large brown pouches of Mixin's to 1 cup of water in a bowl and set aside. Brown 2 lbs. of hamburger and drain the grease. Add 1 can of tomatoes, juice and all, to meat. Stir Mixin's and water mixture into the meat and tomatoes. If desired, add drained can of pinto or kidney beans. Bring to a boil. Now add the small red pouch for the desired heat level. Simmer uncovered for 30 minutes or longer and add water to your desired chili thickness. Stone-ground masa flour, ground chili pepper, a pinch of salt, cayenne pepper, cumin, dehydrated onion, garlic powder and oregano.